Stephania glabra (Menispermaceae) is a climber vein having large tubers which is up to 30 kg. It grows in the Himalayan region up to an altitude [1Upmanyu N., Gupta A., Jindal A., Jalhan S. Pharmacological activities of Stephania glabra,Woodfordia fruticosa and Cissampelos pareira-A review. Int J Pharm Pharm Sci 2012; 4: 16-23.]. Cissampelos pareira (Menispermaceae) grows in tropical and subtropical regions of India and is a very famous herbal plant in Indian ‘Ayurvedic’ system. Presently, these plants have been studied for their antiarthritic activities like in treating inflammation leading to rheumatoid arthritis, gout and osteoarthritis. RA is a long-term disease with dominant extra-articular features and with limited treatment options [2Arnett FC, Edworthy SM, Bloch DA, et al. The American Rheumatism Association 1987 revised criteria for the classification of rheumatoid arthritis. Arthritis Rheum 1988; 31(3): 315-24. [http://dx.doi.org/10.1002/art.1780310302] [PMID: 3358796] ]. Different types of cytokines are known to involve in the pathogenesis of rheumatoid arthritis [3Scott DL, Symmons DP, Coulton BL, Popert AJ. Long-term outcome of treating rheumatoid arthritis: results after 20 years. Lancet 1987; 1(8542): 1108-11. [http://dx.doi.org/10.1016/S0140-6736(87)91672-2] [PMID: 2883443] ]. Pro-inflammatory cytokines like interferon, interleukin and TNF- α that function in the immune system, are the main members [4McInnes IB, Schett G. Cytokines in the pathogenesis of rheumatoid arthritis. Nat Rev Immunol 2007; 7(6): 429-42. [http://dx.doi.org/10.1038/nri2094] [PMID: 17525752] ]. If we would consider only the synthetic drugs for the treatment of RA, then few medicines like Aspirin, Mephenamic etc. are useful. The serum urate concentration of adult women, which is lower than in men of a similar age is related to higher renal clearance of urate in women, and also estrogen promotes excretion of uric acid during reproductive period [5Vashist H, Gupta A, Jindal A, Jalhan S. Animal model for arthritis –A Review. Int J Recent Adv Pharm Res 2012; 2: 20-5.]. Uric acid is the final product of protein metabolism which, when not excreted from the body through urine, enters in soft tissues of the body in the form of urate crystals. This condition causes pain and when urate crystals get deposited in the joints, they cause difficulty in walking with pain. 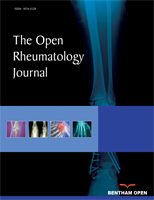 Osteoarthritis is wear-and-tear type of degeneration of bones which is associated with pain [6Hootman JM, Helmick CG. Projections of US prevalence of arthritis and associated activity limitations. Arthritis Rheum 2006; 54(1): 226-9. [http://dx.doi.org/10.1002/art.21562] [PMID: 16385518] ]. In one study, the prevalence rate of arthritis has been shown to increase from 47.8 million cases in 2005 to 67 million cases by 2030 (25% of the adult population), out of which, 25 million cases (9.3% of adult population) have been projected to report arthritis – attributed activity limitation [7Gupta A, Upmanyu N. HemRaj. A review on medicinal plants in the treatment of arthritis. J Pharm Res 2012; 5: 3908-9.]. Several synthetic medicines are being used for treatment and for symptomatic relief of arthritis with a lot of side effects. So, for the safety of patients, the effective medicines from natural sources should be evaluated for the treatment of this disease. There exist some of the plants for gouty arthritis like Allium sativum, Solidagovirgo aurea, Salix fragilis, Tinospora and cardiofolia; Linum usitatissimum, Organum vulgaris, Capsicum annum, and salix alba for osteoarthritis, whereas, Zingiber officinale, Glycyrrhiza glabra, and Curcuma longa for rheumatoid arthritis [8Chopra IC, Handa KL, Kapur LD. Chopra’s Indigenous Drugs of India 2nd ed. 2nd ed.1994.]. Phytochemical screening was performed to check the phytoconstituents in the ethanolic extract [9Farnsworth NR. Biological and phytochemical screening of plants. J Pharm Sci 1966; 55(3): 225-76. [http://dx.doi.org/10.1002/jps.2600550302] [PMID: 5335471] ]. 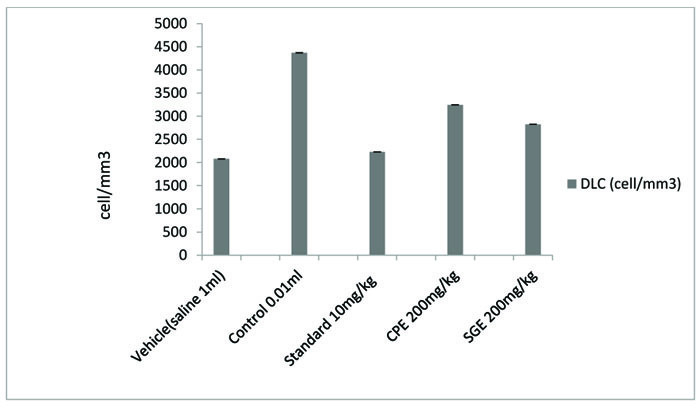 Effect of CPE and SGE on freund’s adjuvant induced arthritis in rats. Total leukocyte count (TLC) in blood samples from Vehicle,FA, IND, CPE and SGE treated rats. Differential leukocyte count (DLC) in blood samples from Vehicle, IND, FA, CPE and SGE treated rats. Concentration of TNF –α after administration of CPE and SGE in blood from sample of rats. Freund’s adjuvant induced arthritis- All Rats were anesthetized by intraperitoneal injection of 5% chloral hydrate at a dose of 0.25 mg /kg body weight. Then, to induce arthritis, 0.01 ml Freund’s adjuvant was injected intraperitoneally into the plantar region of the right hind paw of each rat [10Pearson C, Wood F. Studies of polyarthritis and other lesions induced in rats by injection of mycobacterium adjuvant. General clinical and pathological characteristics and some modifying factors. Arthritis Rheumatol 1959; 2: 440-59. [http://dx.doi.org/10.1002/1529-0131(195910)2:5<440::AID-ART1780020510>3.0.CO;2-N] , 11Kilimozhi D, Parthasarathy V, Amuthavalli N. Effect of Clerodendrum phlomidison adjuvant induced arthritis in rats. A radiographic densitometric analysis. Int J Pharm Tech Res 2009; 1(4): 1434-41.]. Osteoarthritis induced by Monosodium Iodo Acetate (MIA)- Monosodium iodoacetate was injected intra-articularly in a total volume of 50 μl (2 mg) through the patellar ligament of the right knee for the induction of experimental osteoarthritis, using a 26-gauge needle, in anesthetized rats. The left knee joint (control) was injected with saline. Oral treatment with extract (200 mg/kg) was started on day 7 after MIA injection and was continued until the termination of the study. Another group of rats was administered with indomethacin (10 mg/kg) orally. The control group was treated with vehicle alone [12Bar-Yehuda S, Rath-Wolfson L, Del Valle L, et al. Induction of an antiinflammatory effect and prevention of cartilage damage in rat knee osteoarthritis by CF101 treatment. Arthritis Rheum 2009; 60(10): 3061-71. [http://dx.doi.org/10.1002/art.24817] [PMID: 19790055] ]. Total Leukocyte Count (TLC) and Neutrophil count (DLC) were examined in blood samples of the treated and untreated group [13Kumar M, Shete A, Akbar Z. A Review on Analgesic: From natural sources 2010; 1(2): 96-100.]. The serum TNF-α was examined to estimate the concentration of this proinflammatory cytokine by using a standard ELISA kit (‘GENXBIO-make’) for TNF-α. The decrease in volume of paw edema in treated and untreated rats. Values are Mean± SEM value, n= 6 animals in each group. Error bars indicate the LSD (least significant difference (P <0.001) calculated using one-way analysis of variance ANOVA) followed by Bonferroni t-test. SGE and CPE showing no significance with Standard after day 7. CPE is not significant with SGE after day 7. Total Leukocyte Count(TLC) values in treated and untreated rats. Values are mean Mean± SEM value, n= 6 animals in each group. Error bars indicate the LSD (least significant difference (P <0.001) calculated using one way analysis of variance (ANOVA) followed by Bonferroni t-test. 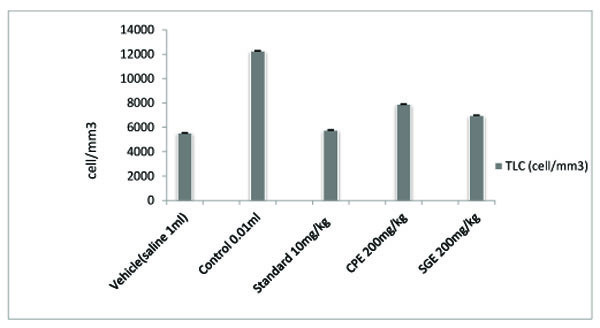 The ethanolic extract of leaves of CPE and tubers of SGE was found to be safe at a dose of 200 mg/ kg. Anti-arthritic activity was evaluated according to the ability of test and standard extract to inhibit Freund's Adjuvant-induced paw swelling, the concentration of total leukocytes count, differential leukocytes count and TNF-α. After the induction of arthritis, the increase in swelling was observed. The diameter of paw volume was measured of the rats of each group on 0, 7th, 14th, 21th and 28th day after the induction of arthritis. The result so obtained was compared with that of the results of the arthritic control group and standard group (Fig. 1 , Table 1). All the groups showed a significant (P < 0.001) decrease in the paw volume after treatment. Comparison between SGE (1.2 ± 0.0150) and CPE (1.3 ± 0.0180) showed the insignificant result on day 7, similarly on the same day when SGE (1.2±0.0150) results were compared with the standard (1.1 ± 0.0250), significant (P < 0.05) results were obtained. Both CPE and SGE were reported to be significant with the vehicle group (group I). Total Leukocyte Count (TLC) shown in Fig. (2 ), Table 2 and Differential leukocyte count (DLC) in Fig. (3 ), Table 3 were examined in the serum of all groups. Blood samples were examined with respect to total leukocyte and neutrophil count in cell/mm3. The concentration for each group so obtained were compared with the control and standard group. All treated groups were found to show a significant decrease in the TLC and DLC each day except day 0. 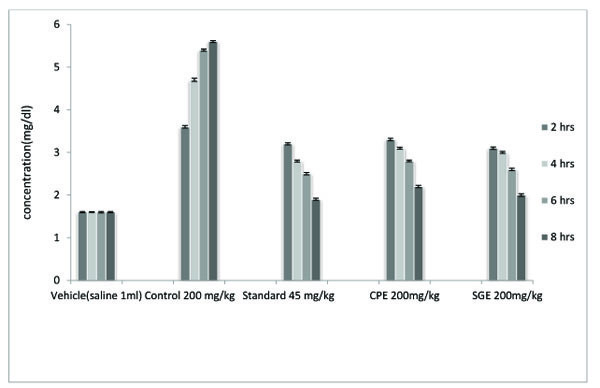 Effect of CPE, SGE and IND on monosodium iodo acetate induced arthritis in rats. 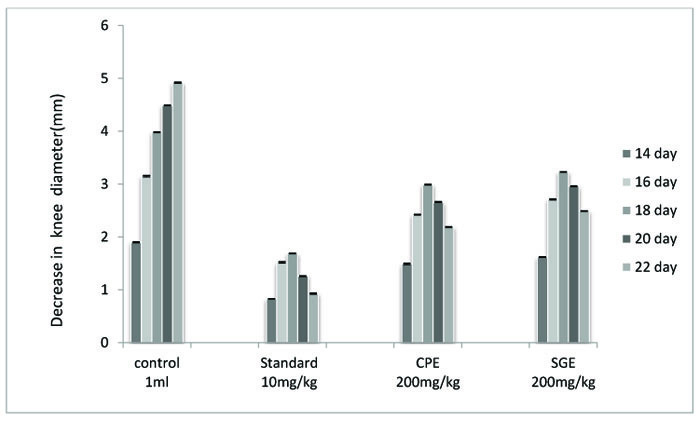 Effect of CPE, SGE and Probenecid on Potassium oxonate induced hyperuricemia in rats. Differential leukocyte count (DLC) values in treated and untreated rats. Values are Mean± SEM value, n= 6 animals in each group. Error bars indicate the LSD (least significant difference (P <0.001) calculated using one way analysis of variance ANOVA) followed by Bonferroni t-test. The concentration of TNF- α in pg/ml was examined as compared to vehicle control, Freund's adjuvant control, standard and extracts (Fig. 4 , and Table 4). All treated groups showed a significant (P < 0.001) decrease in the paw volume. 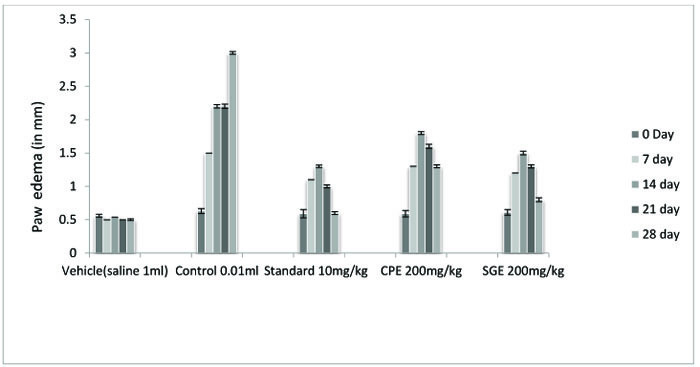 The comparison between CPE and SGE and standard vs vehicle also showed a significant decrease (P < 0.05) in paw volume. to the untreated control group showed a remarkable decrease in the knee diameter but not in comparison with standard indomethacin group. CPE proved to be more effective against monosodium iodoacetate induced osteoarthritis than SGE (Fig. 5 , Table 5).It becomes clear from the examination of blood samples that both the extracts CPE and SGE significantly (P < 0.001) decrease the elevated uric acid level. The significant results were obtained in comparison to the control group II but not with Standard group III (Fig. 6 and Table 6). Tumor necrosis factor (TNF-α) in blood sample of treated and untreated rats. Values are Mean± SEM value, n= 6 animals in each group. Error bars indicate the LSD (least significant difference (P <0.001) calculated using one way analysis of variance ANOVA) followed by Bonferroni t-test. The decrease in swelling of Knee in treated and untreated rats. Values are Mean ± SEM value, n= 6 animals in each group. Error bars indicate the LSD (least significant difference (P <0.001) calculated using one way analysis of variance ANOVA) followed by Bonferroni t-test. In the present study, the antiarthritic activity of Cissampelos pareira and Stephania glabra was evaluated for their ethanolic extracts. Similarly, anti-inflammatory activity on Cissampelos pareia has been reported by using different solvents for extraction and different models [14Wilkonson PC, Vane JR, Ferraria SH. Handbook of Experimental Pharmacology1978; 109., 15Amresh G, Singh PN, Rao ChV. Antinociceptive and antiarthritic activity of Cissampelos pareira roots. J Ethnopharmacol 2007; 111(3): 531-6. [http://dx.doi.org/10.1016/j.jep.2006.12.026] [PMID: 17240096] ]. Ethanolic extract of Cissampelos pareira has been tested against carrageenan-induced inflammation and it was found to be 59.5% and 64.04% effective for acute inflammation. However, the use of Cissampelos pareira has also been mentioned in Panchakarma Ayurvedic therapy [16Amresh G, Zeashan H, Rao CV, Singh PN. Prostaglandin mediated anti-inflammatory and analgesic activity of Cissampelos pareira. Acta Pharmaceutica Sciencia 2007; 49: 153-60.]. In folklore medicine system, decoction of Stephania glabra has been used for the treatment of rheumatic body ache and fever [17Gupta M, Shah BP. Use of Medicinal plants in Panchakarma Ayurvedic Therapy. Indian J Tradit Knowl 2009; 8: 372-8.]. Role and interest of herbal drugs in the treatment of rheumatoid diseases is well established. For example, an antirheumatic in vitro and in vivo study on Eupatorium purpureum has been reported in which Cistifolin was found to be present as the main constituent. Cistifolin inhibits the Mac-ic1 (CD11b / CD18)-dependent monocyte adhesion to fibrinogen [18Maity D, Pradhan N, Chauhan AS. Folk uses of some medicinal plants from North Sikkim. Indian J Tradit Knowl 2004; 3(1): 66-71.]. In one more study, extracts from stinging nettle (Urtica dioica), were reported to show an inhibitory action on the proinflammatory transcription factor NF-κB which is one of the causes of rheumatic disease [19Habtemariam S. Antiinflammatory activity of the antirheumatic herbal drug, gravel root (Eupatorium purpureum): Further biological activities and constituents. Phytother Res 2001; 15(8): 687-90. [http://dx.doi.org/10.1002/ptr.887] [PMID: 11746861] ]. Decrease in uric acid concentration in treated and untreated rats. Values are Mean± SEM value, n= 6 animals in each group. Error bars indicate the LSD (least significant difference (P <0.001) calculated using one-way analysis of variance ANOVA) followed by Bonferroni t-test. CPE and SGE were not significant after 4 hrs. The role of herbal drugs for the treatment of osteoarthritis [20Riehemann K Z, Behnke B, Osthoff KS. Plant extracts from stinging nettle (Urtica dioica), an antirheumatic remedy, inhibit the proinflammatory transcription factor NFkB 1999; 442(1): 89-94.-22Cameron M, Chrubasik S. Topical herbal therapies for treating osteoarthritis. Cochrane Database Syst Rev 2013; 31(5): CD010538. [PMID: 23728701] ] has been evaluated by several researchers. Those previous researches on the treatment of osteoarthritis have shifted the attention from conventional drugs towards safer herbal intervention. Here, by taking this fact into consideration, the ethanolic extracts of two of such medicinal plants namely Cissampelos pareira (CPE) and Stephania glabra (SGE) were studied against monosodium iodoacetate induced osteoarthritis and significant (P < 0.001) results were obtained. CPE was found to be more effective in reducing the raised diameter of the knee. 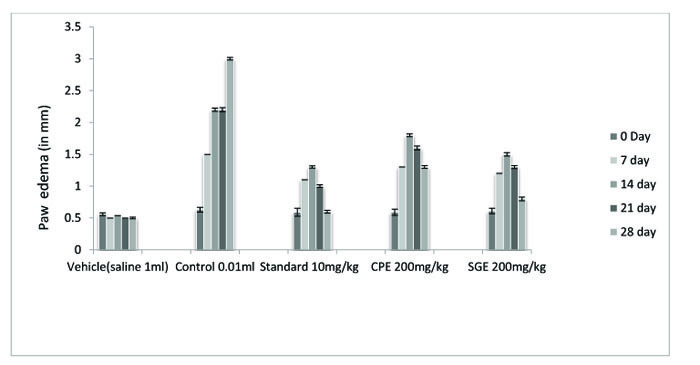 Both CPE and SGE decrease the knee diameter (in mm) in comparison with the untreated control group but showed less decrease in the knee diameter than indomethacin standard group. Chopra IC, Handa KL, Kapur LD. Chopra’s Indigenous Drugs of India 2nd ed. 2nd ed.1994.